specialists in treating this area and offer several minimally invasive options. As we age, gravity and normal physiologic processes cause a variety of changes in our appearance. The eyes are often considered the focal point of our face. The aging process causes several changes to the structures surrounding the eyes that can not only affect our appearance and way we feel about ourselves but can also affect the functioning of the eye itself. The most common associated aging change to the periocular structures is redundancy of the upper eyelid skin – a “baggy” eyelid appearance. In severe cases, this tissue can obstruct a patient’s superior visual field. This is corrected with a surgical procedure in which the resulting scar is hidden in the natural eyelid crease. In addition, many patients note lower eyelid and midface abnormalities that affect their appearance. The most common lower eyelid abnormality is protrusion of the lower eyelid fat pads. This gives the classic “bags under the eyes” appearance. This abnormality can be corrected with either an incision just below the lower eyelid lashes or on the inside surface of the lower eyelid (transconjunctival blepharoplasty). 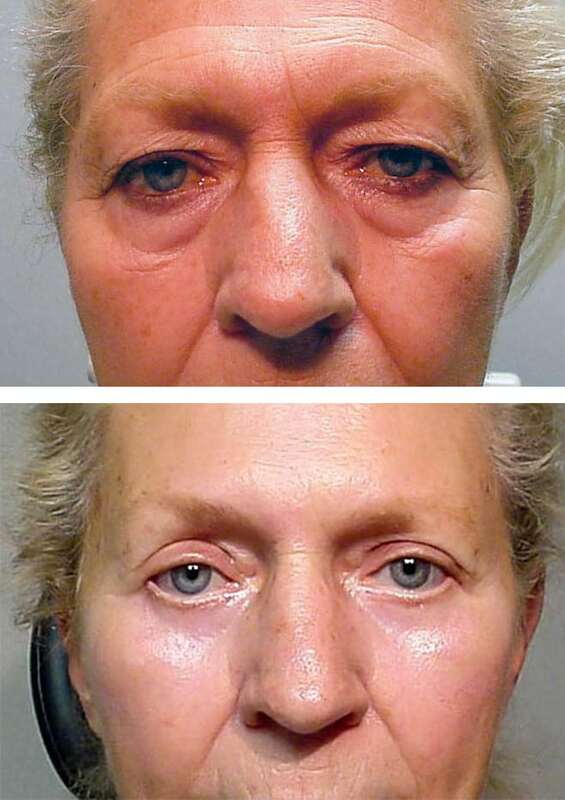 Some patients note prominent cheek folds and laxity of their midface which can in many cases be corrected through the same lower eyelid incision. The eyelids are integral in facilitating the normal functioning of the eye. As such, the eyes are thoroughly examined. A thorough medical history and ophthalmologic history is taken with note taken of any previous eye diseases and/or surgery. Because our physicians are not only trained in Ophthalmic Plastic surgery but Ophthalmology as well, they are uniquely qualified to evaluate and perform this type of surgery. A biomicroscopic examination is performed to assess the ocular surface. The propensity for dry eye formation is evaluated and eyelid function and form are examined. Specifically, the laxity of the lids, the amount of eyelid closure, the position of the lid crease, the eyelid excursion and the position of the lid margin in relation to the eyeball are noted. Upper eyelid surgery (Blepharoplasty) is commonly performed under local anesthesia in the office or as an outpatient. Frequently, patients are asked to arrive 1-2 hours prior to surgery. This allows the nursing staff to draw appropriate lab work, start an IV and answer any further questions you may have. An anesthesiologist will discuss anesthesia prior to surgery and answer any questions you may have. In general, surgery takes approximately one hour. The incision and resultant scar is hidden in the eyelid crease. Lower eyelid surgery to remove “bags” under the eyes or redundant lower eyelid skin can be performed concurrently with upper eyelid surgery or alone. If redundant lower eyelid skin is determined to be present in the preoperative evaluation, the incision will be just below the lashes of the lower eyelid. Many times the lower eyelid is determined in the preoperative evaluation to be too flaccid. If this is the case, the lower eyelid will be tightened along with removal of the redundant lower eyelid fat pads and skin. Some patients are only noted to have protruding lower eyelid fat pads without redundant lower eyelid skin. These patients may have the incision made on the back surface of the lower eyelid – the transconjunctival lower eyelid blepharoplasty. This procedure can be associated with tightening of the lower eyelid if necessary. Some patients also note flattening of their cheekbones as they age. This is frequently caused by descent of the cheek fat pads. If this is determined to be evident in the preoperative evaluation, it can be addressed through either the transconjunctival incision or the incision below the lower eyelid lashes. After upper eyelid surgery, patients may have a dressing placed on their upper eyelids which does not obstruct their vision. For the first several days after surgery, patients must keep their wounds clean and dry. It is not unusual to temporarily be unable to close your eyes after eyelid surgery. For this reason we ask patients to put antibiotic lubricating ointment in their eyes nightly for the first 1-2 weeks. The same antibiotic ointment is placed on the wounds twice daily to prevent infection. Oral antibiotics and pain medication are frequently prescribed. Sutures will either be removed at one week or may dissolve. Postoperative care after lower eyelid blepharoplasty is the same as for upper eyelid blepharoplasty. It is not uncommon to have significant bruising and swelling after blepharoplasty surgery. Blepharoplasty surgery is very safe and is one of the most common aesthetic procedures done. Bruising and swelling are common and usually subsides within 1-2 weeks. Inability to close the eye is also common during the first 1-2 weeks. Significant scarring and pain are unusual as is infection. As with any surgery in and around the eye, there is a risk of loss of vision. Most experts believe that this risk is approximately 1/40,000. Any significant postoperative bleeding, pain, redness or visual disturbances must be reported to your physician. Most blepharoplasty surgery is performed in the office or as an outpatient under local anesthesia. Blepharoplasty surgery is very safe and effective. Complications are very rare and include: bleeding, infection, bruising, swelling, inability to close the eye, scarring and loss of vision. Because we have a unique understanding of the eye and plastic surgery, we are frequently asked to correct eyelid deformities in other surgeon’s patients with sub optimal results.